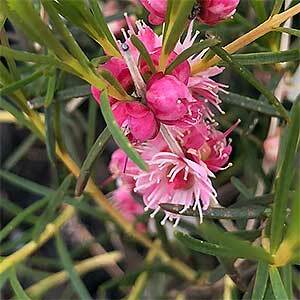 A small Australian native shrub with attractive flowers Hypocalymma angustifolium is commonly called the Pink-flowered Myrtle. The flowers appear white and quickly turn to a rosy pink. From Western Australia very good drainage is required and humid conditions are not suited. This is plant that is well suited to a native style garden, it will also blend in with the general border and can work well in a cottage style garden. A useful and attractive plant for a sunny to part shaded position. Hill up the soil in areas of very wet soil or heavy clay soils. In ling dry periods some extra water will be required. Mulching around the plant to maintain a cool moist root run. A little low phosphate slow release fertiliser in spring will improve performance in poorer soils. Light pruning after flowering will maintain a good bushy habit. Flowers – Pink and White.